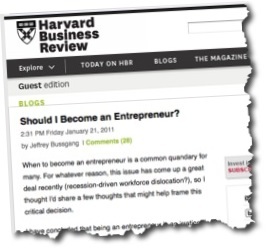 Jeffrey Busgang titles his Harvard Business Review post “Should I Become an Entrepreneur?” I admit, it’s not an unreasonable question, and my response — if you have to ask, the answer is no — is probably unfair and too abrupt. Even so, I answer that way to point out that entrepreneurship is so often something that happens to you, rather than something you choose. You fall in love with a business idea, a product, or a challenge, and you can’t resist. Or the opportunity arises, suddenly, and you say yes to it. The idea that you choose entrepreneurship like you’d choose a sweater is acceptable, I suppose, because so many of us choose careers by establishing our interests. And “I want to own my own business” certainly comes up a lot. My own three decades of entrepreneurship did not start me asking that key question. From the beginning, it was looking with eager anticipation at the possibility of making it on my own. I knew I wanted to do what I liked. But could I cover expenses? Keep the kids in shoes? And then for years it was a matter of making the next mortgage payment, not knowing for sure where the money would come from. And being progressively more unemployable as the years rolled on. I have concluded that being an entrepreneur is an irrational state of being. If human beings were purely rational, evaluative, value maximizing individuals, they would not start companies. If they sat down and did the expected value calculation by laying out the probability-weighted outcomes of being an entrepreneur as compared to taking a safe job, it would not pencil out. How delightfully business-school-like to put it in terms of maximizing expected value calculations. However, I read humor there, Jeffrey’s tongue in his cheek, a suppressed grin. Do you have an idea that no one can talk you out of? Are you prepared to endure with modest or no salary for a few years? Are you bored with your current work environment/life situation? I think he’s got it right, except perhaps his title, because as you look at the content he’s got entrepreneurship as something you can’t resist. Think of it this way: do you dare to escape boredom? Can you? Will it work for you? Quit? Take No For an Answer? Accept Second Best?